It’s finally (finally!) cooling off here, case and so I can justify all of my soups, stews and casseroles. In honor of the cold weather (what? 55° is cold for Miamians! 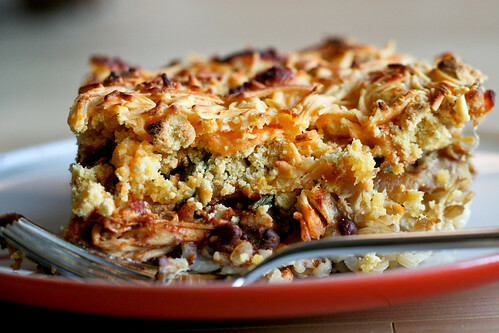 ), I made a spicy Chicken Enchilada Casserole with a crumbly, cheesy tortilla crust. This casserole reminds me of a 7-layer dip, even though you’ll find no canned chili or cream cheese in here. You start with a layer of brown rice, then follow up it with layers of beans, hominy, sauteed onions and poblano peppers, shredded chicken, Enchilada sauce, corn tortilla dough and shredded cheddar cheese. Into the oven for 35 minutes, and out comes a slightly spicy, bubbly, cheesy casserole of goodness. This dish can be made a day or two in advance and baked just before you’re ready to eat. I suspect you could easily freeze the casserole whole for those times when you find your fridge and pantry bare (a trend in my house lately). Tom loved this casserole, and I gotta say, it’s crazy delicious in that messy comfort food kind of way. I can’t wait to get into the leftovers, and I’m thinking about making another batch soon to stock the freezer. There’s just nothing better than a cheesy, melty casserole and a chilly beer to welcome the fall. Preheat the oven to 375° and grease your biggest casserole dish (I think mine is 8″ by 11″ and 3″ deep). Now, make your tortilla dough by mixing the masa harina, water and salt together in a bowl until there are no big dry crumbs. Set aside. Set a large skillet over medium-high heat and add the olive oil, onions and peppers. Saute until the onions begin to get translucent and a little brown, about 5 – 7 minutes. Remove from heat and set aside. Now, assemble your casserole. Add the rice to the greased casserole dish in an even layer, then repeat with the beans, peppers and onions, hominy and chicken. Pour the enchilada sauce evenly over the dish, using a silicone spatula to spread it out. Add your tortilla crust by dumping the masa flour over the top of the casserole and using your fingers to crumble and spread the dough in an even layer over the top. It’s ok if your dough is a little dry – the Enchilada sauce and cheese will moisten it a bit. Finally, spread the shredded cheese over the top. Place in the center of the oven for 35 minutes. Remove from oven and let stand for 5 – 10 minutes before slicing and serving. if I can’t find masa harina (had to google that one) can I use regular flour?? Or will the dough not be the same?? Another keeper! You come up with the best dinner dishes. And 55 degrees is pretty damn cold! It’s that cold here in California in the morning, and all I want to do is stay in bed until the weather warms to the mid 70’s. We sunny girls are spoiled! About the tortilla topping, do you think I could use just regular tortillas instead of the dough? I don’t know where I would find masa harina. oh crap, just read the first comment… sorry! Now that’s a great looking enchilada! I couldn’t find masa at Whole Foods here in Baltimore. I’m going to check out a Latin market down the street from where I work, I’m really hoping they have it. Sounds like a great dish, can’t wait to try it! Yum! They sell Masa Harina at the health food store near me, so I’m bookmarking this! Thanks! James – a Latin market should have it. If they don’t, then crumble some tortilla chips instead. Those should have a pretty close flavor. Oh lovely! Perfect for the fall weather, I’m having in NC. Do you make your own enchilada sauce or use canned? If you purchase it, what brand do you recommend. Thanks! Looks like the masa could be dry. Any problem with that? Or is there sufficient sauce to make the whole thing moist? Kent – The actual masa is a little dry, but no more dry than a tart crust. The sauce and cheese make up in moistness. I’ll have to head over to Whole Foods to grab some masa harina. This looks so good and will be worth the trip! Mel – what a fabulous combination of flavors and textures. While we are riding the substitution horse, do you think you could sub in corn meal or polenta either one for the Masa Harina? Would using either one require any other tweaks to keep the textures/flavor balance the same? Thanks for the recipe I am making this next week! I have the ingredients already. For the sauce for my enchaladas I use tomatoe sauce and the pkgs makes good sauce. I am so excited about your recipe! Serving with lettace, sour cream and fresh limes and fresh pico de gullio on the side. After rave reviews from my boyfriend, I made this for a Cinco de Mayo fiesta anoche! I think it will be a hit. I have been a fan of your delicious recipes and your beautiful, artistic site for so long! I made your amazing Butternut Squash Farro (with pancetta, of course) and my guests LOVED it. A week later I topped it with this delicious enchilada dish. It was fantastic! I served it with a crisp jimica, cilantro, and tangerine salad (with pepitas and a lime garlic dressing) and forget leftovers…we ate every last bite. Thanks so much! Christopher – your jicama salad sounds amazing! are so many choices out there that I’m completely overwhelmed .. Any ideas? Kudos!